Treibball Trainers: You must be a member to be on this list, you should be teaching or have taught Treibball classes. You should have your dog or a student's dog titled at NATE Novice level or equivalent. 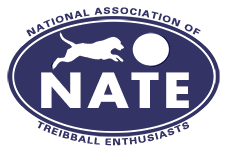 Join NATE and then login and fill out the Trainer List Interest Form to start the process. Please be patient, it may take a few weeks for our volunteers to be in touch. This listing is a compilation of the names and contact information of NATE members for informational purposes only. NATE does not endorse any individuals or companies listed in this directory. NATE makes no representations, warranties or guarantees as to, and assumes no responsibility for, the accuracy or completeness of the information or services or products provided by the individuals or companies listed here. NATE expressly disclaims all liability for damages of any kind arising out of the use or performance of the products or services provided by these members.